Yesterday morning there was no word on the whales first thing in the morning, and after all of them were down south the night before we were worried that they might have all headed out to the open ocean. That's something they usually do from time to time throughout the summer, though this year at least some of them have remained in the inland waters for more than two months straight! 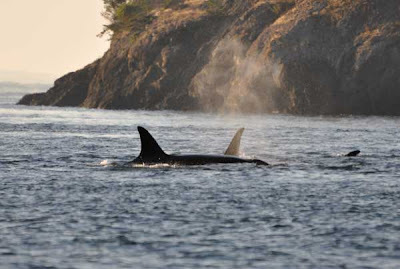 Late morning all three pods were picked up out west at Race Rocks, but coming back in towards the San Juan Islands. So, late afternoon I decided to go look for them. 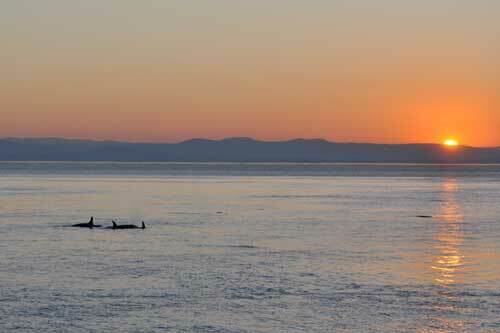 Around 4 PM I could see the boats that were slowly moving across Haro Strait with the whales. By 5 PM I could see some of the whales, and it looked like they were heading right for where I was sitting at Land Bank. As they got closer, a few of them veered to the south, and the rest of them turned to the north about 2 miles offshore. I was thinking about leaving, taking one last look through binoculars, when a whale breached in my field of view much closer to shore. Not time to leave yet! 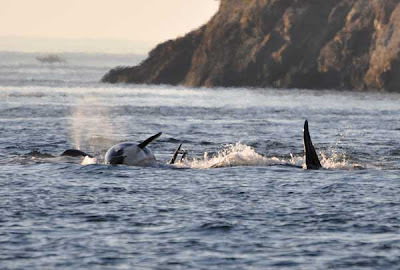 The whales continued to slowly move north, and I inched my way north along the shoreline with them until I was at Lime Kiln State Park and a few of the L-Pod whales that had gone south came north closer to shore. I thought that they might all continue north at this point, so again I considered leaving, when a large group of whales stopped at the point just north of the lighthouse and started milling close to shore. Hmm....can't leave now! I have my favorite rock from which I normally watch the whales at Lime Kiln, but last night I actually abandoned it to head over to the cove itself, because the whales were so far in it! L72 Racer heads deeper into the cove north of the Lime Kiln Lighthouse. Finally, after much indecision, the whales committed to heading south - towards all of us awaiting them on the shoreline! The first group that came by included a little calf that was being pushed at the surface. 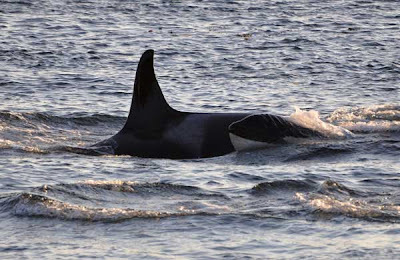 This is like the orca version of a piggyback ride. You can see the calf on its side on the surface in the photo below, surrounded by other whales. 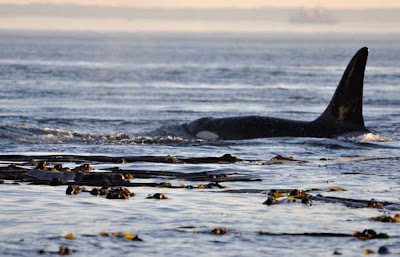 What you can't see in this particular picture is that the baby was also carrying a piece of kelp in its mouth! As the whales swam by the kelp just offshore of the rocks where I and many others were sitting, several of them did spyhops. I wonder if they were looking at us, too? It's always cool to see this many whales, and to see them so close to shore, but there's something extra special about it when the whole thing happens close to sunset. Of course a lot of the whales are silhouetted, which makes identifying them more difficult, but the lighting is so amazing at that time of day, and the blows were just lighting up in the setting sun. K25 Scoter just off the kelp at Lime Kiln Point State Park. There was a gap in the action then, but I could see more blows to the north so I knew more whales were coming. That's what's so amazing about encounters like this when all the pods are together. As soon as one group as passed, you look up and the next group is coming - wave after wave of whales! I also got my first good look at the newest member of the Southern Resident Community, baby L115 that was born just last week. Here is is next to its probable mother, L47 Marina. 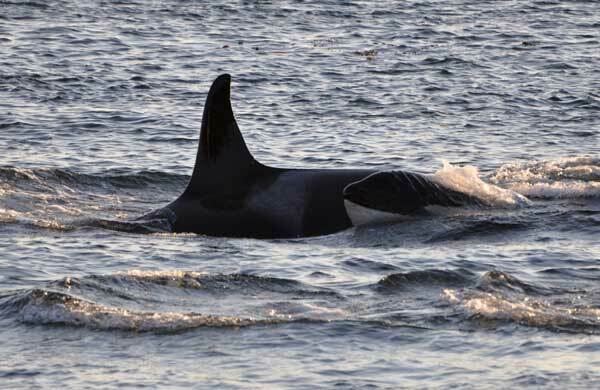 Marina has two adult daugthers, but her last four offspring have all died within a few months of being born, the most recent one in 2008. I know I'm not the only one that has her fingers crossed for the well-being of this new little calf! L47 Marina and the newest Southern Resident Killer Whale, L115. 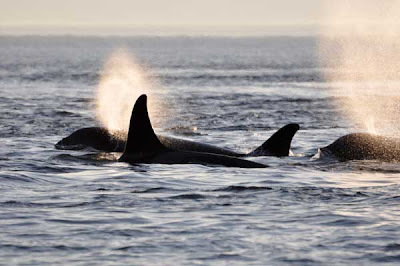 Most all of the whales had gone south, with the exception of the half of J-Pod made up of the J2s, J14s, and J16s. 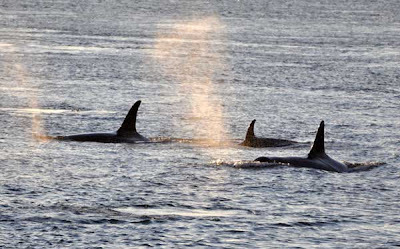 L7, L53, J8, J19, and J41 usually hang with this group that at last word was continuing north. I was close to leaving one more time, but hung back as this group of five whales stalled out in front of the lighthouse. Surely they would head back north to rejoin "their half" of J-Pod? Yup - that's exactly what they did, and they did it just as the sun was setting! J8 Spieden, J41 Eclipse, and J19 Shachi head back north in the setting sun. 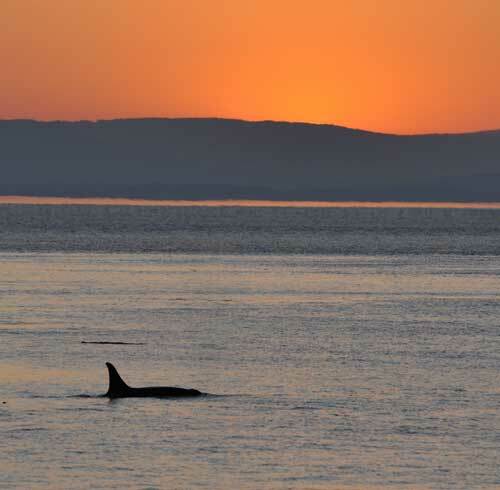 You couldn't have composed a better photo opportunity than this - with the dark silhouettes of the whales breaking the surface under the orangey glow of the setting sun. Finally, after sunset at 8:30 PM four and a half hours after I arrived, it was safe to go home and get some dinner as darkness started to settle in. 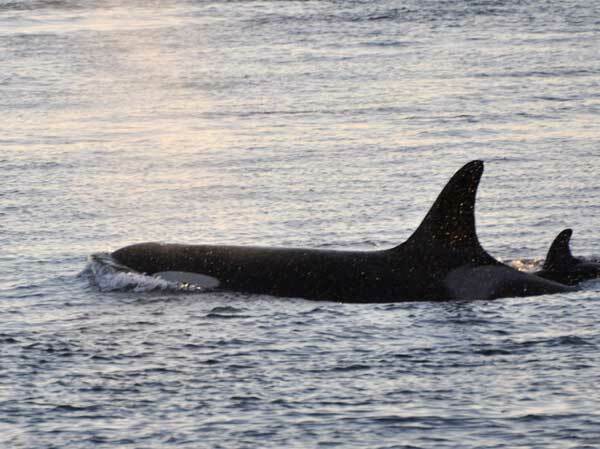 The vocalizations continued on the hydrophones after dark, indicating the whales still continued up and down the westside shoreline into the night. I called this post "the passby I've been waiting for" because there are a couple of times each summer when everything comes together into an amazing shore-based superpod encounter. 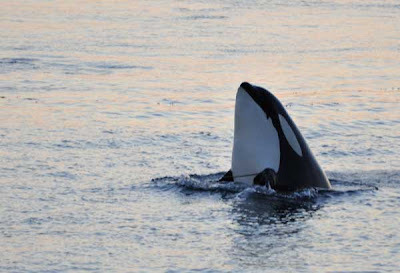 It doesn't happen often, and it hadn't happened for me yet this year, so when last night it finally all came together into one of those orca encounters that I dream about during the depths of winter, I was exhilarated, thankful, and happy. The photos capture the essence of the experience but I also shot a couple of short videos to try and share a little more of what these encounters are like. 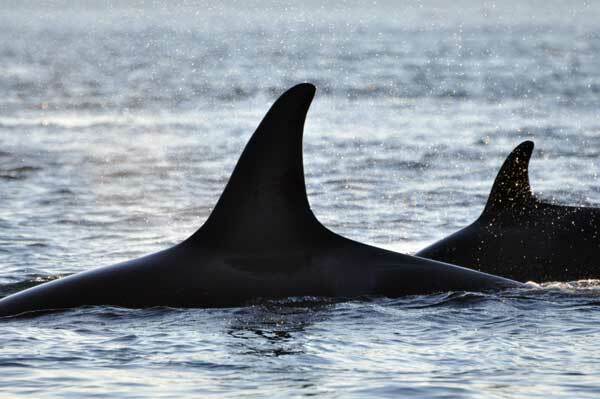 Here's one clip that includes the two adult males L41 Mega and J27 Blackberry surfacing just offshore. I think you'll understand (if you don't already!) why I spend so much time looking for, waiting for, and watching these whales. It's for moments like these, with wild killer whales just yards away from me. Beautiful, Monika! I was listening on the hydrophone last night wishing I was there. Thank you for capturing the beauty of the evening! ITs true an awesome blog. The video was indeed cool. Now I have a question..Are the pods you mention the same ones that Keiko (Willy from Free Willy) and family are from? Also how can you tell these are the same ones that are in different areas..I am just really amazed at these. Amazing. I am so jealous. One of my biggest dreams is to see Orcas in the wild. Thanks so much for sharing this, I am living vicariously through you for now. Carole - Glad you at least got to listen to it! I bet the vocals were outstanding. Kate - Keiko was actually from the Iceland area. 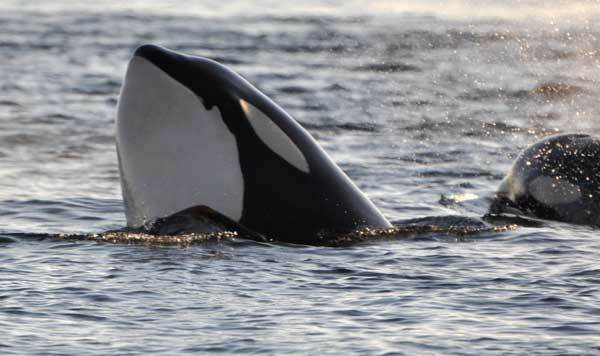 Individual killer whales can be identified by their natural markings including the gray mark called a saddle patch that is right behind their dorsal fin. We have a photo ID guide of all the whales in the local population (the Southern Residents) and they all come back here year after year. The wild whales featured at the beginning and end of the Free Willy movies area all actually the Southern Residents. Rachel - You'll just have to make it to San Juan Island at some point! I'm glad you're enjoying the blog in the meantime. Great pics, Monika! What a night! Wow! that is really cool Monika. Thanks for sharing the clip and photos. Here in Bermuda we get Humpback whales in April/May. Most times the are a few miles off shore. Rarely do they come in close. The sunset photos are amazing! I've been enjoying your blog all summer -- another great entry -- thanks! I'm on East Point, Saturna Island, and watch the Orcas come by all summer -- usually very close to shore as they were in the encounter you describe here. I don't have a blog, but have a photostream on Flickr -- http://www.flickr.com/photos/mrmritter/ -- maybe we should compare notes some day. Thanks again -- excellent blog! Katie - SO happy you were out there too! Yuri - Thanks! 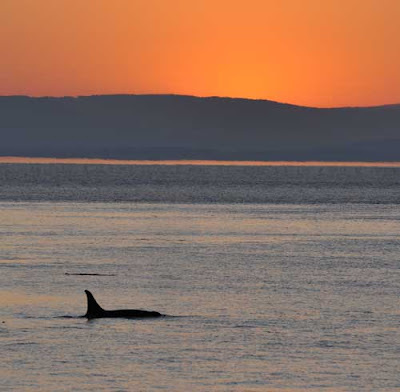 Yes, it is a pretty special place to whale watch here. 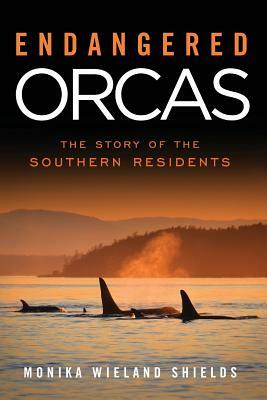 mrmritter - East Point is one place I have always wanted to watch orcas from shore. Whenever I'm on the boat and we see them pass there it seems like they're right on the rocks! Your photos are amazing and back up feeling that it's a great place to watch whales. We should definitely compare notes! Do you live on Saturna? Fabulous commentary and thank you for keeping us well updated and helping us identify who we are watching. We were watching them from our house in Hannah Heights all evening, and listening well after the sun had gone down, so they must have come back down from Limekiln. All we could here was whale breath under a moonlit sky,just perfect. The whales have spent a lot of time hanging here this summer so we have been blessed as we get great views from our deck. This morning we were out kayaking (no boats around, quite blissful) and several groups appeared, traveling South. Clearly fishing intently but quite a few breaches and tail slaps. We think J Pod was in the lead with Ruffles, but there was a very small baby in the second group, so possibly L pod as well. Thank you for the info..that's very interesting to learn...looking forward to your next entry. 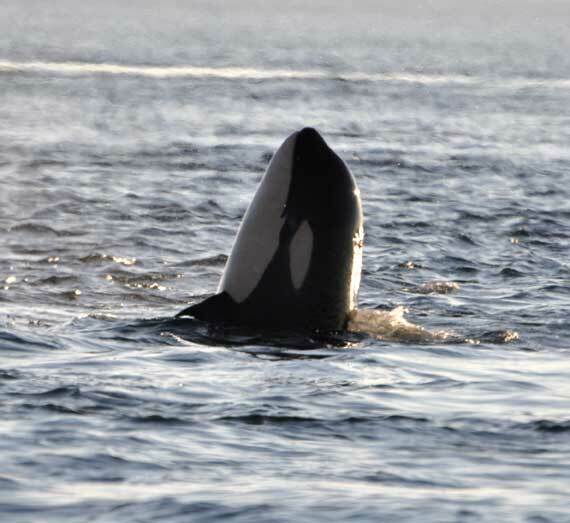 Monica -- I live on Saturna in the summer, on the bluff overlooking Boundary Pass, so I see most of the Orca transits. The beauty of East Point is that you can get very close to them -- sometimes about 15 feet away -- and from the lighthouse bluff, you can also look down on them and follow them underwater -- which has become by my preferred point of view this summer. I believe East Point offers the best land based viewing of the Southern Residents if you consider proximity and sheer spectacle -- but they obviously don't spend as much time here as the west side of San Juan Island. I love your blog -- have learned a great deal from it. It has been very helpful to me in sorting through what I have seen on the same days as your encounters. Thanks!